This is an intriguing topic, and something which took me some time to narrow down to a single design. On hearing the topic, my first thoughts were of the text-book type of illustration of plants and flowers, or the Victorian drawings of plants. Since ‘botancial’ covers all plants, it was difficult to decide which flower or plant to choose. Then my thoughts went to the life cycle of plants, and how they are made up, leaves, flowers, seeds. At last I crystallised my thinking around the seed-bearing parts of plants. There are so many distinctive seeds, but I decided to contrast the solid rounded Teasel heads with the delicate spidery flower-like seed heads of Sweet Cicely. I found a rich green Tissue-tex paper that was perfect as a background for the delicate Sweet Cicley, and I used this as the centre-piece of the design. 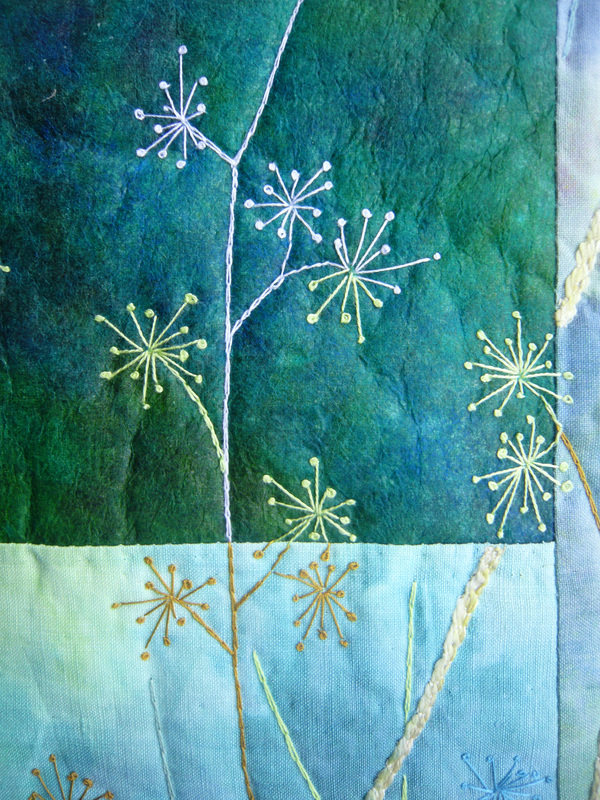 I used hand dyed fabric in paler shades of green to surround the centre, as a background for the darker Teasel heads. 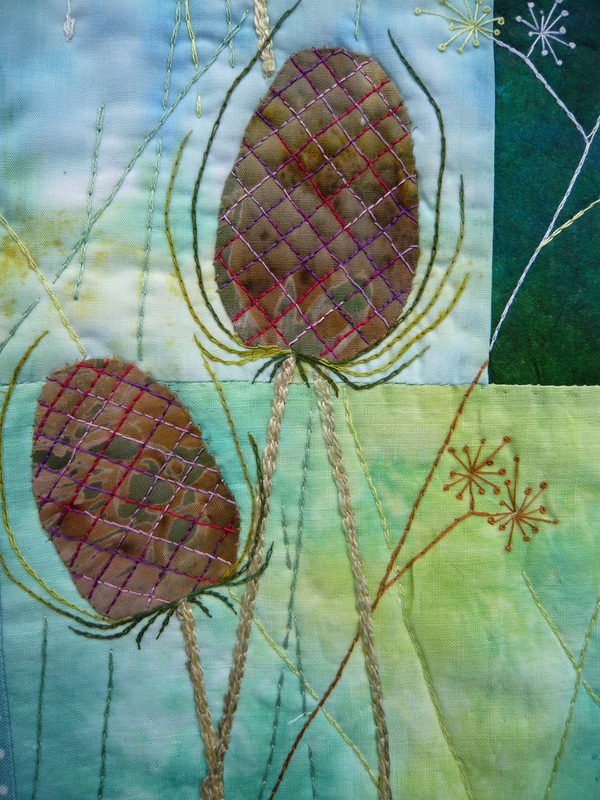 The Teasels were added to the background using hand-turned applique and the stalks were groups of silk yarn couched down. Once this was done, the wadding and backing were added. 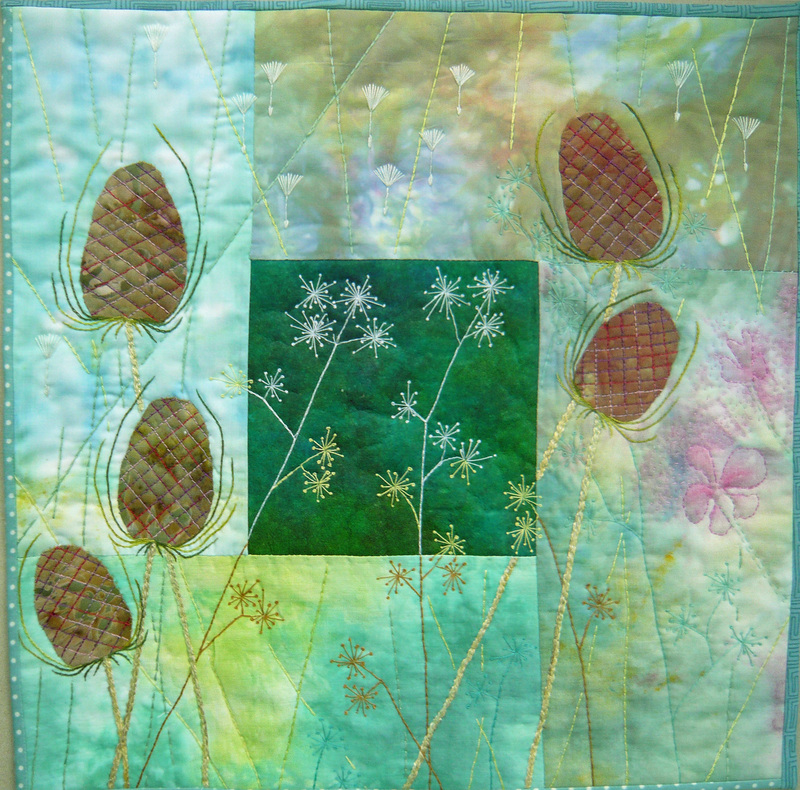 The quilting was all stitched by hand, and this included all of Sweet Cicely plants, the criss-cross pattern on the Teasel, and the vertical grass stalks. 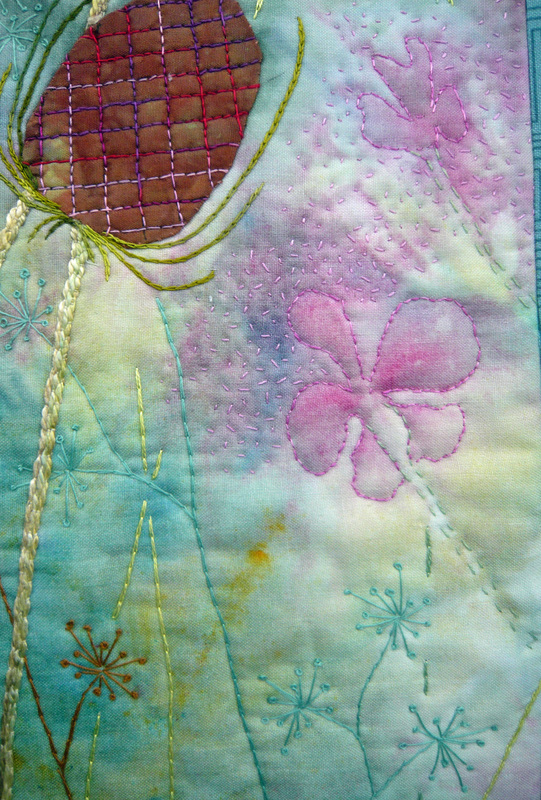 I added some pink flowers and pink seed-stitch (appropriately) to add a little interest and colour. Finally I added some Dandelion seeds floating down from the top of the piece. I had toyed with the idea of producing a piece which consisted of several layers of sheer fabric along with paper and other textures, for this challenge, but the general feeling of the group is that a quilt should incorporate wadding. So I compromised by producing a ‘normal’ quilt but with the added use of Tissue-tex. I found that the tissue is quite unforgiving, in that you can’t undo any stitching without leaving holes, so you need to be sure of where you want to stitch. So perhaps our group’s parameters saved me from a great deal of heartbreak and hard work if I had used more paper! This piece delighted me completely. The more I look at it, the more I see — such as being surprised by the purple-pink flowers stitched into the lower right. Thank you! 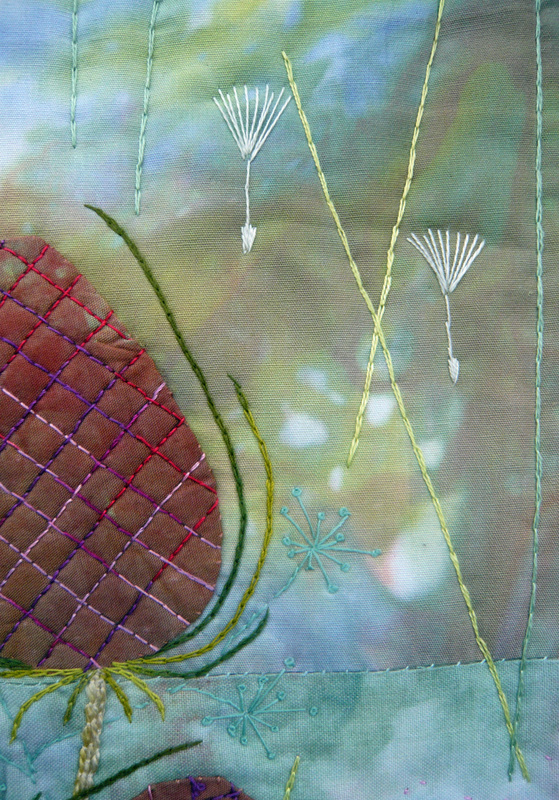 Love your composition and the delicate colors surrounding the tissue-tex. Nice handstitching. Joan you have created another stunning piece. I love the colours and all the stitching. I must keep an eye out for the tissue-tex paper I am sure it is available in NZ. Your dandelion seeds look like little parachutes! I love the delicacy of this and wish that you had tried the layers of sheer, they would have been perfect! Teasels are a favourite of mine…. This is such a delicate piece and your hand embroidery is beautiful ! I love it. Love your story, love your quilt and love the way you worked it out. This really is a stunning piece, with great contrasts in colour and very subtle at the same time. You can keep looking at it and more and more details catches your eyes. A very nice interpretation of the theme! I like this a lot. To me it looks very gentle and reminds me of the English countryside in late summer. Your stitching is lovely. Joan, I really like your quilt! The colours and composition are very good. Lovely handembroidery. I am always in awe of those who create their pieces by hand. This piece is a delight. It invites the viewer to find the details….it is a bit like going on a treasure hunt. A beautifully executed piece. I love seed heads; I remember when I was a child harvesting the seeds of pansies, fascinated by how they emerged from the bloom. Gorgeous stitching, and a beautiful quilt!